We are currently out of the exact spiderweb turquoise shown in the ring in the photo but will match it with something very similar. Spiderweb turquoise sterling silver ring design by Mark Hileman. 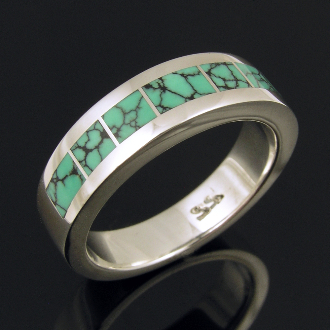 This handcrafted ring band showcases some of the best spider web turquoise inlay the southwest has to offer. The 6mm wide silver ring is masterfully inlaid with 7 pieces of beautiful spider web turquoise. The turquoise is light blue with a hint of green and has a nice black spiderweb matrix. The ring is hand signed "MMH" by Mark McBride Hileman on the inside and stamped sterling silver. Many customers have chosen to wear this style ring as a wedding band or man's engagement ring. This ring is shown in a size 10 for scale and is available by special order in most ring sizes (see drop down size menu). Please allow 3 to 6 weeks for us to build the ring in your size or in your custom inlay combination. See our possible ring Customization options. This ring is also available in 14k yellow or white gold or stainless steel for an additional charge. Upgrade to tarnish resistant Continuum sterling silver for added durability and maximum tarnish resistance.